I pre-ordered this one, but for a number of reasons I never got around to read it until now. And I am glad I read it. 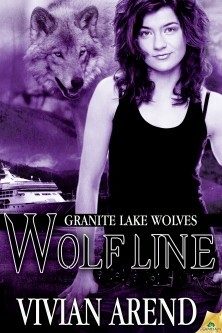 It was nice to re-visit the Granite Lake wolves, and get another insight into the world that Ms Arend has created. Unlike the previous books, which took place in and around Haines (mostly), this book took place at a cruise ship. Which has its problems. I loved how the demands from the passengers and the unexpected problems affected Jared’s and Keri’s relationship. At first glance, Keri and Jared felt like an odd couple but as the story went on, I started to see that they weren’t an odd couple. In fact, they match each other quite well. I had a blast following them, from the bumpy start to their HEA. One thing that I loved was the mix of romance and. I especially liked how intergral the mystery that was to the story. ( Sometimes a mystery subplot feels tacked on to add length, but not this time.) The search for the thief kept throwing wrenches into the relationship. I loved how they thrusted each other, and worked out their problems. The only thing that I didn’t like was Jared’s secrets. Yes, I can understand the wish for him to live a quiet life, but as his secrets was revealed, I couldn’t help wondering how the rest of the Granite Lake Pack will react when they finds out.